IMRAD research papers examine the acronym that describes the structure of scientific journal articles. IMRAD is an acronym, standing for Introduction, Methods, Results, and Discussion. It is generally used to describe the structure of a scientific journal article of original research. For the most part, these types of articles will follow the IMRAD format. In the introduction, the article states the research question and answers the question as to why the particular study was undertaken. 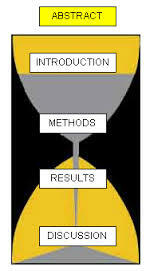 The methods section describes when, where, and how the study was conducted, and the study participants. Results display the answers to the research questions and reveals if the hypothesis held trued. Discussion, the final section, fits the research findings into the larger scientific community and theorizes about future implications. IMRAD has proven to be remarkable standard in scientific journals since the middle of the 20th century, especially in areas of biomedicine as published in public health journals. The 6th edition of the APA publication manual recommends the IMRAD format for empirical studies. Many publications also expect an abstract, which is a stand-alone section that provides the article in brief. IMRAD formats facilitate literature reviews, allowing readers to locate pertinent information with ease. However, critics charge that IMRAD can be simplistic and rigid, forcing the writing to conform to an artificial structure that does not necessarily reflect the actual scientific process. Academic Writing research papers overview the form of writing that is intended to be formal and impersonal in tone, such as a term paper, thesis or a dissertation. Paper Masters writes custom research papers on IMRAD and examine the acronym that describes the structure of scientific journal articles.